Your Dentist Says Regain Your Life with Dental Implants in Hutchinson! Whether it’s one or a full arch, living without your teeth has caused major shakeups in your life. A simple task like speaking to a group of people now becomes a burden because of your missing digits. And you’ve even had to give up some of your favorite foods because you can’t chew them. Your dentist says there is a solution to your woes – dental implants in Hutchinson. Read on to learn about this amazing form of restoration! The dental implant is the only form of tooth replacement that matches the stability and sturdiness that your natural teeth roots provide. The implant is made of a very strong material called titanium that is biocompatible (is accepted by the human body) and is surgically inserted by your dentist into your jawbone. It will later fuse with the same and form a new foundation that will support a restoration and contribute to your jawbone’s production of new bone cells. Implant-Retained Crown ­– For a single missing tooth, your dentist can attach a crown restoration. The porcelain fixture will match the color of your other teeth and will be custom-designed to fit into your smile line perfectly. Implant-Retained Bridge – If you have two or more teeth missing consecutively, you will receive an implant-retained bridge, which is a fixture that holds several porcelain crowns. It provides a way to restore your teeth in a less invasive way than placing an implant and crown for each missing digit. Implant-Retained Dentures – For a full arch of missing teeth, many patients turn to traditional dentures but have to endure them slipping or falling out. With implant-retained dentures, that problem is corrected using two strategically placed and angled implants to hold the prosthetic in place. Having your teeth restored with implant-retained fixtures is a time-sensitive matter because the longer you go without any jawbone support, the more bone mass is lost. If there isn’t enough available, then the dental implant won’t be able to seat properly. Thus, to get on the road to fully restoring your teeth, it’s important to be proactive and reach out to your dentist in Hutchinson to schedule a consultation. 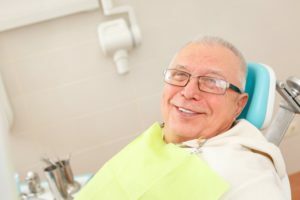 While there, the professional will take the time to thoroughly examine your mouth, teeth and gums to make sure you’re healthy enough for the dental implant procedure and to ensure that you have a sufficient amount of bone available. Soon, you’ll have a full set of teeth with the ability to speak normally, eat your favorite foods and smile with confidence! Dr. Grant D. Ringler is a graduate of the University of Nebraska Medical Center College of Dentistry and has gone on to provide dental care to the Hutchinson community for the past 30 years. One of his specialties is oral surgery, which allows him to successfully place dental implants and restore patients’ smiles and functionality at his private practice. Dr. Hutchinson can be reached for more information through his website. Comments Off on Your Dentist Says Regain Your Life with Dental Implants in Hutchinson!